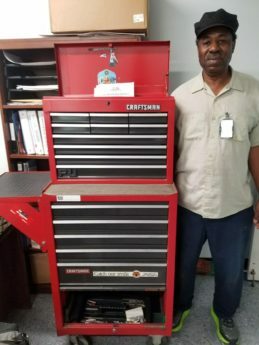 CLT Base Maintenance AMT Bill Edmond with the toolbox he won in today's raffle. The winning ticket for the toolbox raffle was drawn at today’s regular business meeting at the Local Lodge. The winner was Bill Edmond, AMT in CLT Base Maintenance. The raffle raised $2220.00 for the family of Paul Armstrong. Brother Paul worked on the Line at Charlotte and passed away earlier this year. His family asked that our Local auction his toolbox and its contents. Thank You to all our members who purchased raffle tickets. Your generosity will go a long way to help Paul’s family pay expenses. Cookout & Bake Sale Fundraiser for Ayxza Barahona this Friday! !